I read this article last week and thought it was so fascinating. 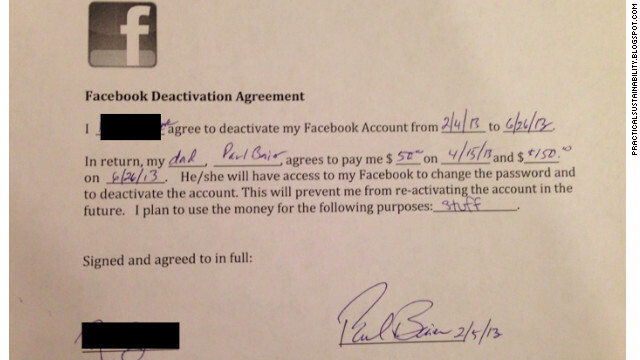 A Dad in Boston paid his teen daughter $200 to quit Facebook for five months. They don’t say. The article says it was the daughter’s idea. was she feeling left out or unloved? did she just need a break from the added social pressures that the internet has brought to teenagers? I don’t know. But I get it. About twice I week I feel like running from the internet and I promise you my Dad could call me tomorrow and make a similar offer and I would truly consider it. But my favorite part of this whole deal? She’s gonna buy some “stuff.” Teenagers are hilarious. What do you think of this? Do you see merit in it? Is this something you’d consider for the student in your life? Why or why not?